October 07, 2018, Durban, South Africa: THE MEC for Economic Development, Tourism and Environmental Affairs lost no time in congratulating the provincial winners of the prestigious World Travel Awards held in Durban at the weekend. Durban scooped four coveted awards, while three globally-famous accommodation venues also took home trophies at the glittering gala event at the Inkosi Albert Luthuli Durban International Convention Centre. The event is the annual search for the finest travel and tourism organisations in the world and WTA is considered the “Oscars” of the global travel industry. There was great anticipation-followed by celebration-at the African and Indian Ocean leg of the WTA Grand Tour on Saturday night when the winners were announced. Durban won four awards with the ICC receiving the honours for being Africa’s leading meetings and conference centre, lifting the trophy for the 17th time. Durban also took the award for being Africa’s leading city destination and for being Africa’s leading meetings and conference destination, while the Port of Durban received the trophy for being Africa’s leading cruise port. The neighbouring Hilton Hotel was named South Africa’s leading business hotel (Hilton Hotels and Resorts was also named Africa’s leading hotel brand), while the five-star Oyster Box in Umhlanga collected the trophy for being South Africa’s leading hotel. And the Villa iZulu @ Thanda Safari, north of Hluhluwe, was named Africa’s leading luxury private villa. MEC Zikalala who took to the stage on behalf of the provincial government to collect the trophy for Durban being hailed as Africa’s leading meetings and conference destination, said later that he was honoured and humbled to have received the award on behalf of the millions of hospitable people of KZN. “KwaZulu Natal has now cemented its position as the darling of excellent international mega events. This particular award recognises the work done by our Meetings, Incentives, Conventions and Exhibitions (MICE) industry. The award was a solid acknowledgement of the never-ending excellent service that tourism players offered to the province’s guests and delegates when hosting international events. The province planned to use such high profile gatherings as a vehicle to attract the attention of potential investors and tourists which was essential in growing the economy, thus reducing the current high levels of joblessness and poverty, he said. “The current estimates are that, in the next three years, the total direct impact from MICE will be in the region of R1.1billion. Tourism KZN is on an aggressive campaign to increase the number of international tourists,” he said. The campaign to grow international tourist numbers was already bearing fruit and the latest statistics had revealed that some 2 000 more international tourists arrived via King Shaka International Airport in the first three months of the year compared to the same period last year. More airlines were flying directly into KZN and at the end of the month, British Airways would also start flying directly from Heathrow into King Shaka International Airport, the MEC said. Negotiations were also underway with other international airlines and the provincial government was confident that it would soon be announcing that another airline would also land directly into the province. 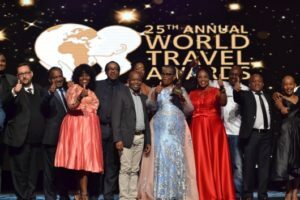 Phindile Makwakwa, the acting chief executive of Tourism KZN, said that the WTA awards, which cut across the geographical spread from Durban to Hhuhluwe were a testimony that the industry had worked hard. Extending her congratulations to the winners, she pointed out that the awards provided the region and its many tourism attractions and products with confidence to continue with the very best service delivery. “These awards once again throw the spotlight on our provincial tourism assets and this international recognition can only auger well for the future,” she said. He was not surprised that the Oyster Box had been named the leading hotel in the country, he said. South Africa was also named Africa’s leading destination, while South Africa Tourism received the trophy for being Africa’s leading tourism board.